One of the things that was discovered in my progression as an artist through the benefit of my colleagues was the created landscape of "From Dust." The turbulent, rolling nature of the happenstance negatives, the diffusion of light from crisp edge to blurred fade, all lead to an ultimate understanding of the creation of a contextual landscape in which the raven flies to its ultimate disintegration. After "Crossing Over" I was again interested in shooting someone, but in the style of Edward Weston, Ruth Bernhard, or even the Brooks contributor Christopher Broughton, I wanted this time to create a landscape of the human body. 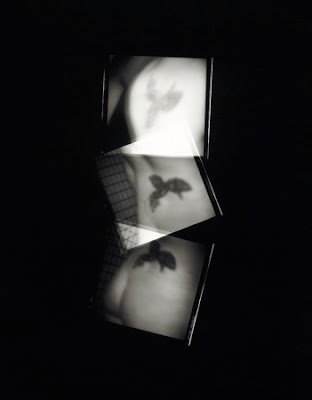 Again it seemed that accident played a roll as the camera that I used for the process, my grandfather's WWII field camera - a completely manual twin lens reflex, I accidentally double exposed one of the frames that should have been of my shoulder but instead became a superimposed image of my shoulder and my back, with the raven tattoo I have sported since 2000 evolved into a violent apparition reaching for the ethereal escape at the top of the frame. Even though I love that particular frame, the image itself didn't really come together. The twin lens reflex could not focus at the distance at which I was hand holding it and that ultimately led to a feeling of trying to be "artsy" and "out of focus" for effect rather than some accidental necessity. Although I still want to try and explore the curves and alterations of a constructed, abstracted human landscape, the intent with this one was not fully realized. I never even named it. However, the result was something tremendously beneficial. The minds in my class, those previously lovingly labeled "The Six," along with the beneficent guidance of our instructor led me down the road of working more closely with the precision of the moment rather than the desperately wanted (and therefore forced) happy accident. Of course, when you don't want it, again it rears its head and serendipitously provides you with an answer of sorts. In this case I wanted to explore the feeling of being trapped, of being "permanent" in the way that a tattoo (despite the marvels of modern technology) stays with you forever. In truth, my tattoo, one that was painstakingly designed with the aid of a brilliant artist, was a cover up of one that I received when I was an impressionable teenager trying to please someone other than myself. It was a stupid move and the thought of having that mark of weakness was very distressing to me. So I designed something that mattered to me. Something that led to where I am now. A stained glass raven the marries the discovered ideology of my raven mythology and the nurtured spirituality of my Christian roots. I am a highly spiritual person, so the marriage to me was the only clear way to regain myself, to take back the part of my body that had somehow been appropriated at the behest of someone who is now insignificant to me. But I also realized that the tattoo, the feeling of being labeled and trapped, was one of perception. A created cage that I imposed around myself and used, for many years, to label myself as weak and impressionable. I am neither. I may have been naive back then, but even then I had a strength of character that prevented me from giving up my other, very closely held beliefs. Even though my father may disagree (the tattoo is not his favorite of my characteristics) there are many worse things that I have been pressured to do that I never did. Not once. It is a badge of honor that you cannot see, but that most people who know me understand completely. So I believe it is unfair to label myself, and ultimately treat myself with all the associated guilt, of someone who is weak minded and small. The cage here is perceptual. The raven, though apparently caged is, in reality, free. She is free to move, free to fly, free to escape the constructed shadow of her cage. The happy accident in this one was with my lack of preparation. Due to my need for a homemade studio in my apartment, I waited until all signs of life had quieted for the night and the final lights had flickered into slumber. I set up the camera, the lights, the bird cage suspended from a c-stand with a boom. I tied my hair up and positioned myself for the test shots. After I found the right location, the right distance, the right swing of the focal plane for the desired effect with the rear standard of my Toyo GX 4x5 camera, I went to switch from Polaroid to film and found. . .no film. Crap. What I did have, though, was a stash of Type 55 Polaroid that comes with negatives included. What I like so much about this image aside from the plane of focus and the intended use of the perceptual bars is the remeniscent edge of Type 55 on each of the frames. I think it adds quite a lot to the overall story, to the continuing evolution of film to digital. It was several weeks after I took this shot that I learned that Type 55 was no longer going to be made. I have a few frames left, but I cannot reproduce an image like this ever again. In some ways, that makes it more pertinent, and more precious, in the process at hand. In my own personal corrosion and discovery. Last Thursday was the First Thursday show for the graduating MFA class. Seven bodies of work hung in the Cota Street Gallery that are as diverse in approach and subject matter as they are in execution and personal style. It is a show that seems to marry these eclectic images with grace, courage, and infinite beauty. Today I was privileged to sit in on the project defense of one of these bodies of work. It was my goal to experience a defense, to learn more about this work, and to support my friend. I was not ready for the grace, poise, introspection, and courage of the presentation. It was stunning. In some ways I felt like I was out of place, though in truth the defense had been classified as "open." But I am so glad to have been there, to have seen that the defense is not something to be feared or anxious about, but rather to be embraced as another opportunity to reveal a layer about the work. Something precious and imperative. The work has always been stunning to me, as Bradshaw himself has been something of an enigma in my time at Brooks. For me, he evolved from instructor to mentor to employer to classmate to colleague to friend. The personal nature of his work, married with the incredible technical skill employed in its creation, has been a great inspiration for my own work. There is a symbiotic relationship between the meticulous crafting of his tiny rooms in heaven and who he is as a photographer, an individual. In a similar way, I find myself craving the tactile manipulation of my work and am more fulfilled when I have interacted with the materials, created the mythology, and visually constructed my own temperamental ideology. It was one of my greatest honors being in that room today. It remains a great honor to be counted amongst the friends of such an artist. And it was a journey of discovery and wonder watching the stoic instructor from my early career at Brooks peel off the layers of his persona to ultimately reveal something so elemental and raw. In some ways it is an evolution I cannot mimic, as I may as well have cut my veins and bled upon the page from the beginning. His reserved and perfect demeanor has been carefully cultivated to the point that this type of revelation, this emergence from the depths, is something of a miracle in and of itself. And it is one in which I can truthfully say the real and achingly beautiful Robert Sky Bradshaw has been honestly revealed.